I split up the information so it wasn't too long and overwhelming. 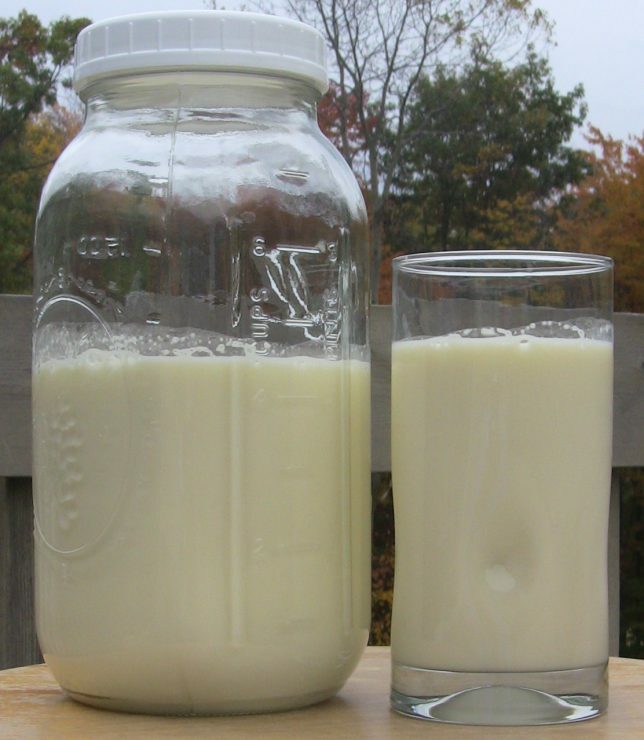 Post #1 – The benefits of raw milk are explained in this post, which begins below. Post #4 is a guest post from a friend, Michelle, on how they decided raw milk was the best choice for their family, or “fresh” milk as Michelle prefers to call it! Also, here you can find the complete list of posts about raw milk. What the heck is “raw” milk anyway? The first time I found out someone I knew (a friend, Kathy) was drinking unpasteurized milk, I thought she was nuts. I'd never heard of anyone doing such a thing, and I didn't know WHY anyone would. She gave me some to try and I had the same response others have had who try our milk from the farm, “But…it tastes just like milk!” My husband, Kent, who grew up on a farm, said, “No kidding, Kel, what did you think it was going to taste like?” (Sometimes the taste does change depending on what the cows are eating, but most of the time it tastes better than “regular” milk from the store, much more fresh, that's the only word I can think of to describe it. Also, for those of you who think whole milk is “too thick”, whole raw milk has a much lighter taste to it.) I also remember thinking, “I thought we had to drink pasteurized milk so it didn't have harmful germs in it!” This was a huge concern for me, so my next post will cover the topic of safety issues in raw milk. Have you heard about how nutritious it is? Most conventional milk now comes from cows who are raised in confined, inhumane conditions, instead of being out grazing on grass like they're supposed to be, and this makes for cows who become ill more easily. More infections equals more antibiotics, which we then consume when we eat the tainted beef or drink the tainted milk, and our resistance to antibiotics goes up even further. So the next time we really need them to work, they won't be as effective. And remember healthy fats, like dairy fat, are good for you, and help you lose weight, too! Conventional dairy cows live 4 years compared to cows out on pasture the way God intended: 12-15 years. That alone tells you there must be something very wrong going on. By the way, some people tell me this is a non-issue for them, since they're not milk drinkers anyway. I'm hoping those of you will revisit that decision not to drink milk, or give it another try. Milk in its original, natural form from grass-fed cows is FULL of what our bodies need – it's that way because it's how God made it! Not convinced? Don't believe me! Do some research yourself and see what you come up with. There's no doubt that you'll find plenty of debate on both sides of the argument. But if you think there might be some truth to what I'm saying, take the time to do some more reading. The links below are a good start! Part #2 in raw milk series covers raw milk safety and some logistics – where to buy it, costs, etc. Why ultra-pasteurized milk is even less healthy than regular pasteurized milk, organic or not! Check the dates on your milk! A date 2 months away is NOT a good thing! Hmmm. . . . . I was going to finish reading but, “how ‘god’ intended” is NOT a reasonable or logical explanation to why something is and doesn’t give proof to support your claim. You might have something worth reading but, I’d rather find a source who explains their topics using science rather than mythological giants in the sky. Saritah, if ever you feel an inkling to search out whether or not God is real or you would like to ask someone questions you may wonder about, feel free to email me anytime & I’ll try to help: [email protected]. FSGinger, well there’s a huge difference between “processed” and one step to ensure reduced (arguably) potential dangerous bacteria in food. I think the poster meant unrecognizable as the original food source. That said, raw is not bad and in many cases better than cooked, ie milk. Why on earth do you use the same reasoning against raw as you accuse those of being so simple minded in their condemnation of cooked. Most foodies eat a combination of raw and cooked. I think people are intelligent enough to make that choice and don’t need people or governments that think like you to be the arbiter of what is good and what is not. Further raw milk has been used for centuries of a variety of animals, modern science likes to throw out centuries of true double blind studies, we don’t. One overtly simple idea is that science/governments = know what is good for you. Research genocides of any century and I think you’ll find that those behind those atrocities want everyone to accept that simple minded idea, well because it’s “good for you”. Drink your grass-fed raw milk raw, via kefir, via cheese, via yogurt and be glad for it. Love your website! 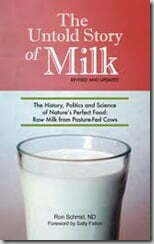 I have been interested in switching my family to raw milk and have been researching its benefits. My grocery (Forest Hills Foods) carries Hilhof milk which you mentioned on comment #3. You say that it is not ultra pastureized and nom-homonogized….so does that mean we would still get the same or close to the same benefits of raw milk? I am already switching my family over to raw cheese which they seem to like…not sure about the raw milk though….might be a hard sell! Where do you buy your raw milk? Hilhof is a very good 2nd choice, but nothing beats raw milk from a farmer you trust. Raw means just that, all the nutrients are *totally* fresh and intact and it tastes so good! One more note. I was disappointed to see that this milk comes in plastic bottle and frankly didn’t taste as amazing as the milk which we have been drinking latety: local milk from grass-fed cows, non-homogenized, low pasteurization. I think it may be because that milk comes in a glass bottle. Any thoughts on this? Plastic is always a bummer. What you could do is once you get it home, transfer it to half-gallon glass ball jars! Quick question for you! Hope you can answer this for me. We just got our first gallon of raw milk yesterday. I had a glass yesterday and today and each time I feel “heavy on my stomach”, bloating. My husband felt the same way. We normally can ear any diary with no problems. What could that be? I’m not sure, I’ve never had that. Maybe someone else will jump in if they’ve ever experienced this??? we drank raw milk on and off over the last year depending on how easy it was to get a supplier. a day after starting to drink it again my 2 yr old has had diahrea and vomiting.There was a tummy bug going round so maybe the timing of the raw milk is just coincidence? Any chance it could be the milk. I’m so worried, not sure whether to give it to her while she’s still got d & v? On the other hand I’m thinking it might help her recover. Google search just says to avoid raw milk with diahrea??? I’d love to know what you think as can’t trust much on google re raw milk. Has anyone else in your family been sick? If it was me, I’d prob just let my 2 year old get over the bug first (and push other liquids) before giving more milk, just in case. There’s always a chance of a bug in raw milk (same as there’s a chance with any type of food), but we’ve never had any problem at all. Doesn’t mean there isn’t a first time. As long as you know your farmer WELL and know that they are smart about how they’re caring for their cows, chances are slim. But better safe than sorry. That’s just my thoughts. Then today she replied saying someone else was sick at her house who doesn’t drink the raw milk so she’s sure now that it wasn’t that. I’d say that’s a good compromise, much better than store-bought pasteurized/not homogenized, because you’re doing it yourself and you know the farm. BUT encourage your husband to do more reading if possible and pray that he comes around. In the meantime, maybe you could only “lightly” pasteurize it…??? You may even want to talk to your dairy farmer about this bug you tested positive for, or try to email Ron Schmid (google it – he’s written a book on raw milk) and get his take on it. The fact that you had no symptoms is interesting. I know you’re probably swamped, but I’m not on Facebook, and I could use a little good advice when you have a moment – no hurry. I recently started drinking raw milk (from what I consider a very clean and trustworthy dairy) & prompty tested positive for a serious bug on a random gut test for something else – I had no symptoms, by the way. No big deal, and maybe it wasn’t the milk at all, but it scared my husband enough to try to ban raw milk from our house. I’m still drinking it, but he’ll only allow my kids to if I pasteurize it first. They’re 2 and 4 and not big milk drinkers. Is it worth getting them hooked on milk if we’re “not allowed” the real stuff? Heart disease runs in my husband’s family, too. We tried coconut milk tonic, but just can’t do it. I absolutely respect my husband’s authority, so is home-pasteurization without the homogenization a good compromise? In the Bible we see “the land of milk and honey” which is a choice land. I imagine milk was a good thing in the Bible days. Yes, that’s a common question, see comment #8 above. … but just think in terms of common sense. What is more natural? How did God design it? ummm….God designed cows milk to be given to calves not humans. Carrie, try talking to your farmer, it may be something the cows have gotten into – once our cows got into a field of dandelions or something and the milk was nasty that week! However, I do have to say, that in the middle of the summer, especially with our previous raw milk farmer, when the cows were out on fresh grass (when it’s the most nutritious milk! ), it had an off aftertaste. That is always a sad time for me, because the rest of the year, when it’s good, it’s soooooooo good. It’s crazy, though, because half our family doesn’t even notice it, and the other half of us can’t drink it. I hate that I’m in the half with the picky palate! Hi JK, raw butter is best (especially if you’re putting it on something that won’t be heated), but I don’t have a good source, so I use organic butter. Even non-organic butter is much better than any of the nasty margarine tubs. Would like to check if there is any difference in butter like in milk ie raw vs pasteurised. Does it suffice to buy organic butter without having to worry that it is heated, denatured etc? Hi L, good question, because that is one that comes up often. If you go to this post, https://www.realmilk.com/healthbenefits.html, a little over half-way down, there’s a section titled, “History of Milk & Evolution” – read that whole section and he makes a great case for drinking milk. One piece of info from there that I found especially interesting: “Domesticated animals were first used for milk eight to ten thousand years ago.” He goes on to explain how that came to be – good information. How could God have created evolution if in Genesis it says He created the earth in six days? I’m trying to justify the switch to raw milk in my mind. I can see that it’s closer to nature, the way things are supposed to be, the way God intended, and that makes sense. Jody, I got some maple syrup in the fall through HW Farms on Belding road for $44 a gallon, but it seemed quite weak. Last week I got more from our old raw milk farmer, but he’s an hour away up in Fremont. His is only $36 for grade A or B.
I’d love to hear of other options in the GR area if anyone knows some. Regarding Hilhof’s milk at Kingma’s, you do get $2.00 back if you wash and return the glass bottle….yeay recycling!! It’s great milk and worth the extra money for our family. Anyone know where to get good organic pure maple syrup these days that doesn’t cost a fortune? Just an additional post with regards to the Hilhof Dairy milk. Those prices come with a $2 (I believe) deposit on the glass bottles that you get back when you return them. Just FYI. I know though – expensive. We also currently purchase the Mooville at Heffron. Wow, get this! I just called Hilhof Dairy Farm (231-832-1313) – their cows are grass-fed, and their organic milk is pasteurized (not ULTRA pasteurized! ), and non-homogenized! The only kicker: I called Kingma’s to check prices: $4.99 half gallon and 1 qt. is $3.49 – OUCH! We’ll probably stick with Moo-ville for my day care kids & our back-up milk for now. I’m not sure if anyone else knows this… but Kingma’s Market (on Plainfield) just started carrying organic milk in glass bottles from Hilhof Dairy in Hershey, Michigan. I haven’t been able to find out any more about them (so far)(like if they grass feed, etc), but thought I’d pass this along anyway. I am SO amazed that you are writing a post on this right now because I was just thinking of asking if you guys are still doing that. I am looking forward to the rest of the series. I think I will start tracking our milk usage for the next few weeks to get a better idea of how much I will need to commit to.